Please note that a 100% deposit is required to guarantee this reservation. The reservation will be regarded as preliminary until deposit is received. In this case the hotel may consider alternative requests for the same dates. The brand new hotel Moscow Marriott Novy Arbat is situated on the banks of the Moscow river close to downtown and the cultural heart of the city: the Kremlin and Red Square, Arbat street, many Embassies and Government buildings. Moscow Marriott Novy Arbat is ideal location whether you have a business trip or your main goal is to travel around the city. 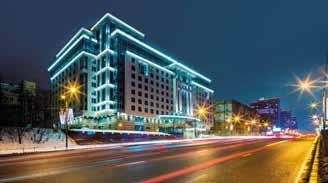 The hotel is close to Moscow City business area and Expocentre Fairgrounds, while the Moscow river ensures you can reach easily all touristic sites and point of interest whether your into culture or culinary delights. All public space and guestrooms of hotel have been designed according to the latest needs of a modern traveler.